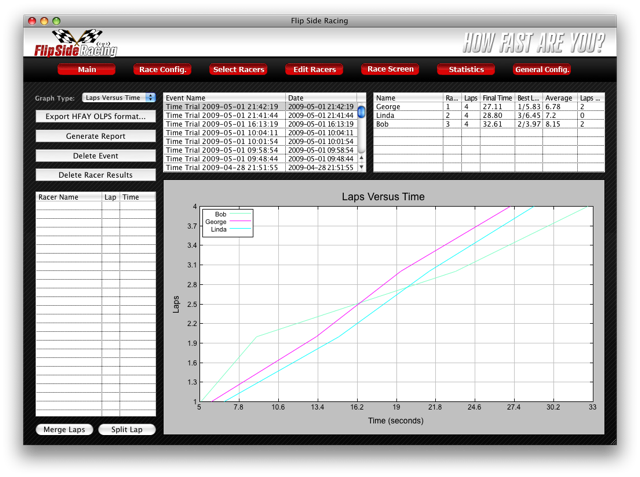 Flip Side Racing Software is an open source, cross platform lap counting software project that currently supports the Core Speedway RFID based and Kyosho IC lap counters. The software has been developed primarily by me with a large amount of input, testing and other help from the Mini-Z community. Q: What generic tags can I use? Generic tags must be initialized to be used with the Kyosho IC Lap Counter. 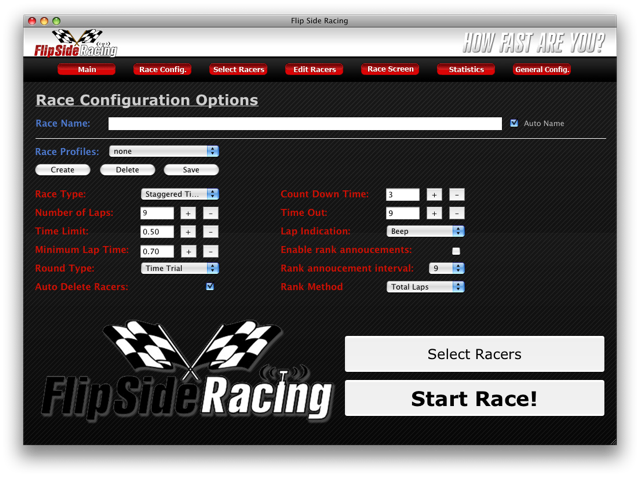 Use the application from the Flip Side Racing website to initialize generic (non Kyosho or dNaNo) tags. Q: How much do generic RFID tags cost? A: The best way for me is if you go to the project website and create a ticket. You have to register an account first but that is easy, you only need to set a username and password though an email is good to enter also even if it is not requires. After you have an account you can then create tickets for bugs or feature requests. You can also email me through the forum here or even create a thread and I will respond. Q: Can you add feature XYZ? A: Possibly, depending on the difficulty and the number of people wanting the feature. I am willing to consider any idea but my time is limited. Q: What is the status of your lap counting hardware? A: Work still continues slowly as I am focused on polishing the software. Q: How can I help with the project? A: There are many ways you can help. I can use willing people to write documentation, create graphics or program. Q: Do you accept donations instead? Q: How do I change the background? A: You can overwrite the BG_Frame.jpg file in the theme directory or copy your background to the theme directory and edit the theme.xml to point to the name of your file. Q: I changed my club logo on the General Config page but the Race Settings page still shows the Flip Side logo, why? A: The club logo setting on the General Config page is only for the logo that gets inserted into reports. To change the logo on the Race Settings page you need to edit the theme.xml. You need to change the mainlogo and mainlogomask entries. The mask is a black and white image that defines the transparency. Q: The text color used for the racers is hard to see, how do I change it? 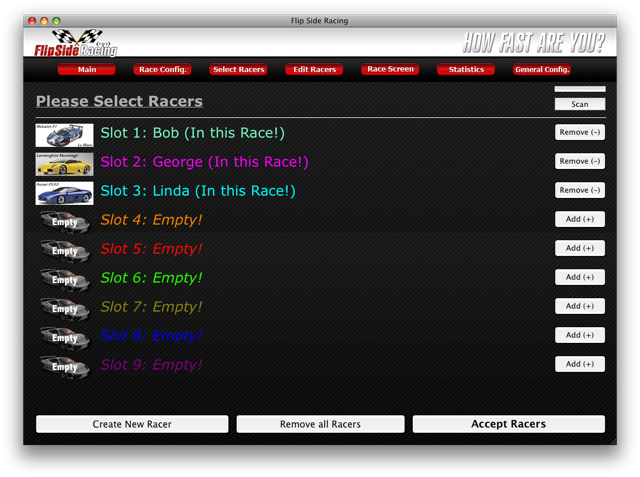 A: On the Select Racers screen click some of the text, you should get a popup window that allows you to change the text color. Q: Can I use the keyboard for counting laps instead since I do not have lap counting hardware? A: Yes, just set the UID of the racers to whatever keyboard character you want to use. Except r, do not use r as hitting that key will cause the software to announce the ranks. Q: How do I sort heats, qualifiers and mains? A: The software does not have event management yet. That is a feature I will add eventually but it is far from complete. Q: Will this mess up my Core tags? A: No, the Flip Side Racing software does not write anything to the Core tags. They will continue to function with the Core software after being used with our software. Q: Will this mess up my Kyosho/dNaNo tag? 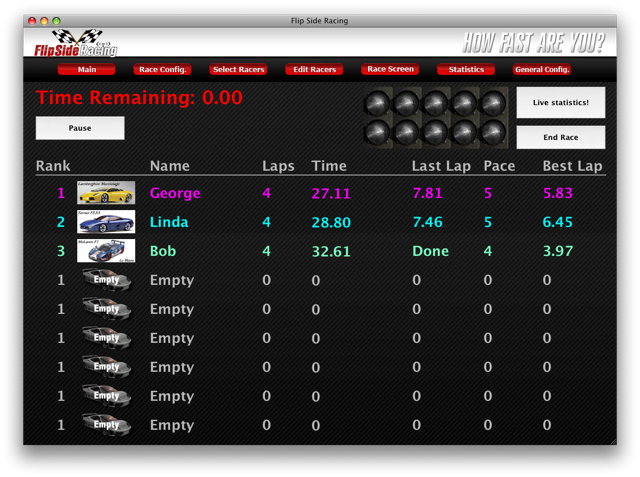 A: No, the Flip Side Racing software does not write anything to the tags. There is a separate program for initializing generic (non Kyosho/dNaNo) tags that if it were used with a Kyosho tag it would no longer work with the Kyosho software. Do not initialize Kyosho tags using this separate program. Q: Can I change the speech spoken by the program? A: To change the speech in the software you need to modify the language.xml file. Modify it using a text editor and change any of the entries between the <exampleentry> </exampleentry> tags. If you are translating the speech to a different language you will need to change the text to speech settings for your Operating System (Windows or Mac). Two translations are included with the software, German and French. To add German or French text to speech capabilities to Windows you need to download the Microsoft Reader product and the Text To Speech language for it. Last edited by pinwc4; 2010.09.15 at 11:28 AM.